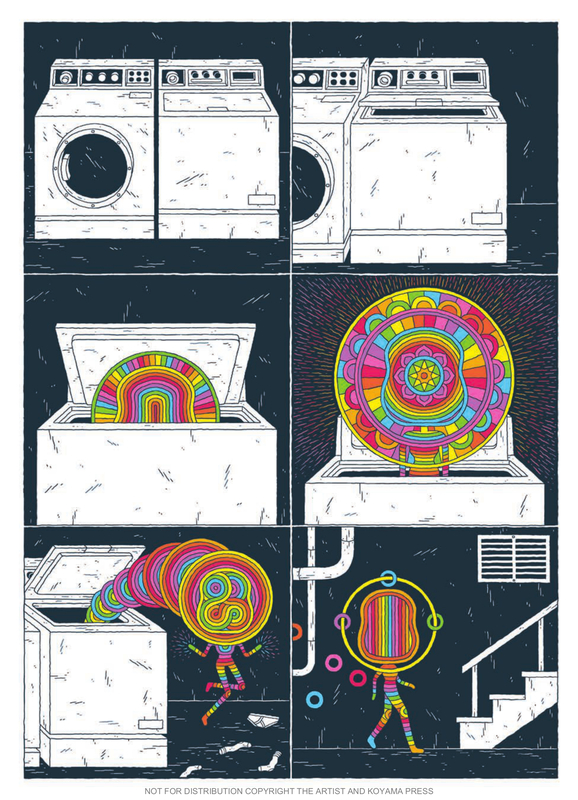 Crawl Space, by Jesse Jacobs. Toronto, Canada: Koyama Press, May 2017. 96 pages. $19.95, hardcover. *Ed.’s Note: click images to view larger sizes. One time at the preschool where I work, a four-year-old asked me what “orange” means. I said it was a color, like pink or red, and she didn’t get it. So, I told her it was like a carrot or cheddar cheese or an orange itself, the way they look. She had had the wrong right answer for all of those: Skinny? Soft? Round? I was out of ideas. How should I explain color without a point of comparison or reference? The science of it, sure, but telling a little kid that color is what our eyes see depending on the size of a light’s wavelength is a whole other series of problems. The art of it did me no good either, because words like “vibrant” and “waxen” and “smoky” don’t quite make the cut for tiny humans whose vocabularies are around a thousand words. Luckily, the little girl got bored as I thought about all this. She rubbed my arm gently and said, “I like your fur.” As I read through Crawl Space, I thought about that girl and all those questions I asked myself years ago. How did we first intertwine our lives with color, with no frame of reference in our brand new world? The book starts with an abstract party scene that turns into a birth—or vice verse. The colors remind me of Nickelodeon splash graphics and textbooks I had as a kid. It’s not totally unfair to cast the more solidly-rainbow tones of the color spectrum as a bit of nostalgia—Fruit Stripe gum and a fascination with rainbows are childhood endeavors, I guess—but there’s much more at work here. The first of several incredible full-page panels go all-in on the psychedelic foundation of the book. From the first time I saw it, I felt that the art on this single page told me the majority of what I needed to know about the pages ahead of it, from the variety of shapes to the simple repetition of the colors. The fading in the middle distance made me think that Kerouac and Wonka got together to build a dream. Why is anything like anything anywhere? is, admittedly, not a very deep or original conceit—a dude in college told me the same thing once before he tried to get me to sign up for his ultimate frisbee team—but in the context of what little we know about the bright rainbow universe everything is happening in, it at least makes sense. If we survive, we adapt. Normalcy is the simple product of quantity and repetition. The book holds onto this thread for a bit, bouncing back and forth between the real plane of existence and the more surreal one, before weaving it together with the responsibility of being the gatekeeper for such an easy way to slip from world to world. The person standing between the Technicolor of the world inside the washing machine and the black and white drabness of daily horseshit is a girl named Daisy. Daisy finds out what we all find out: teenagers are dickheads most of the time, especially when the only way they can figure out their existence is to walk the path they like best, for better or worse. This is quite the beautiful book, but there isn’t much to hang onto in terms of the word-based story. It’s not necessarily a cautionary tale, though a lack of caution is what creates the friction needed to propel the story, and it’s not necessarily a teen drama, though a mixture of youth and danger is exactly what it is. As the book itself points out, there isn’t much difference between school age friendships built around who has a swimming pool and school age friendships built around who has a portal to a different dimension. As more, different kids come of age either through or because of the non-physical plane, they enhance the overall experience of their life with higher highs and lower lows than they’d known before. 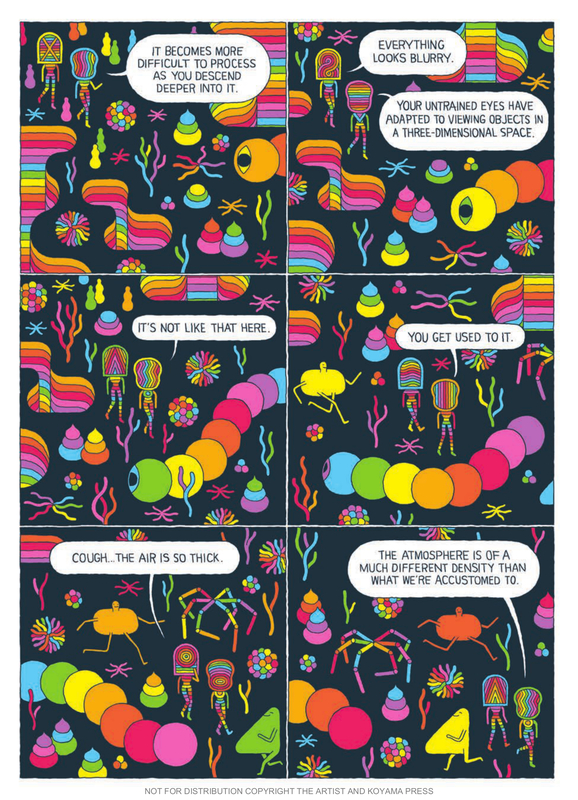 It’s a bit surface and on-the-nose, but much like the sporadic page of panels that attempt to scientifically explain the other dimension, it’s all good enough to not collapse under the art of the book, which is the real joy to be had here. So, while the story isn’t too different than the bleak spin on youth and frustration of Black Hole by Charles Burns—except instead of an STD that mutates teenagers, the Crawl Space universe makes people turn into transcendental personifications of colors—the narrative of the art is superb, and make the whole book a more than worthwhile endeavor. Daisy and the people she knows transition between the black and white and the psychedelic in search of pleasure or friendship or maybe even just a better understanding of self, and in those hyper blasts of simple-color geometry, Jesse Jacobs builds to a gorgeous, lifting resolution. With enough color, regardless of what “orange” is, peacefulness is possible. I’ve had this in my to read pile since it came out and I devoured all his other books as soon as I got them.